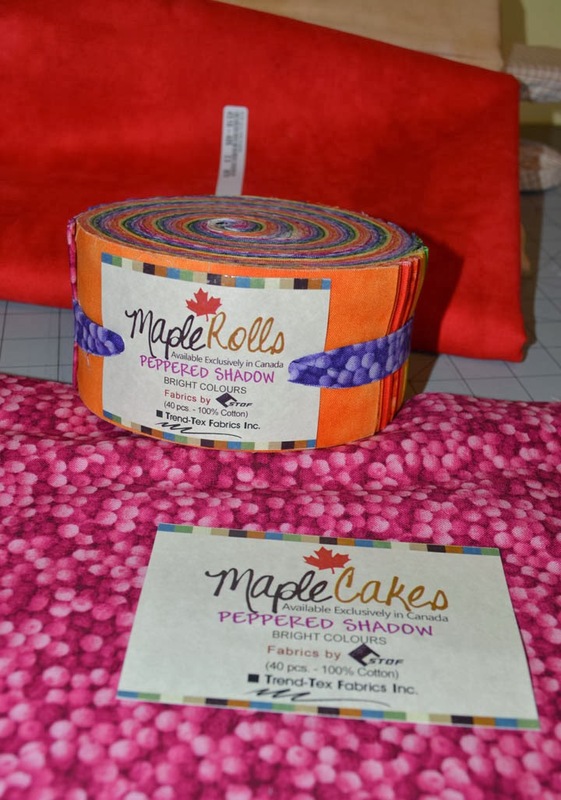 I have been resisting sampling from the pre-cut smorgasbord- that tempting array of delicious sounding fabrics done up as jelly rolls, layer cakes, etc. 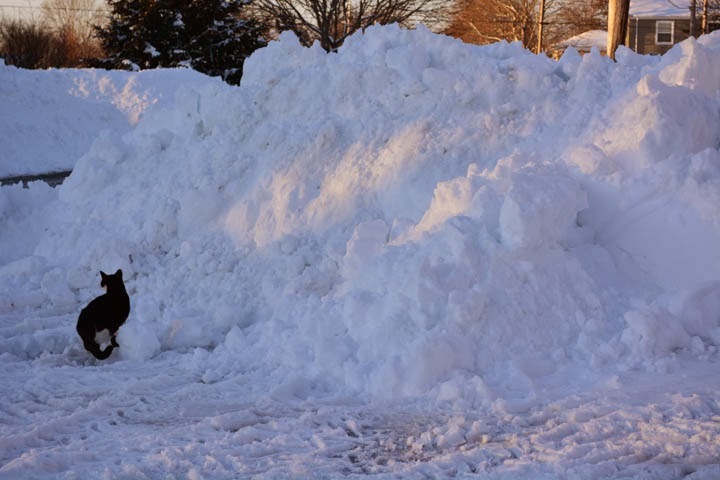 I am more of "a metre of this, a metre of that" kind of gal which of course generates lots of leftovers. 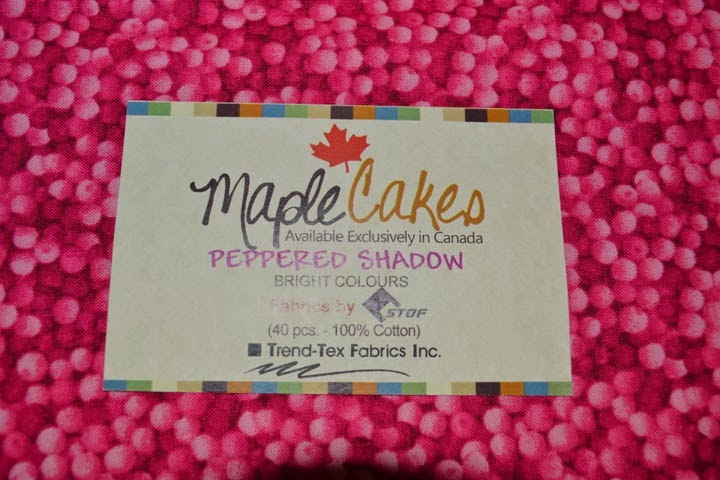 This week I am taking a nibble at a Canadian offering of delights from Trend-Tex Fabrics Inc: Maple Rolls and Maple Cakes, both served up with a bit of pepper. 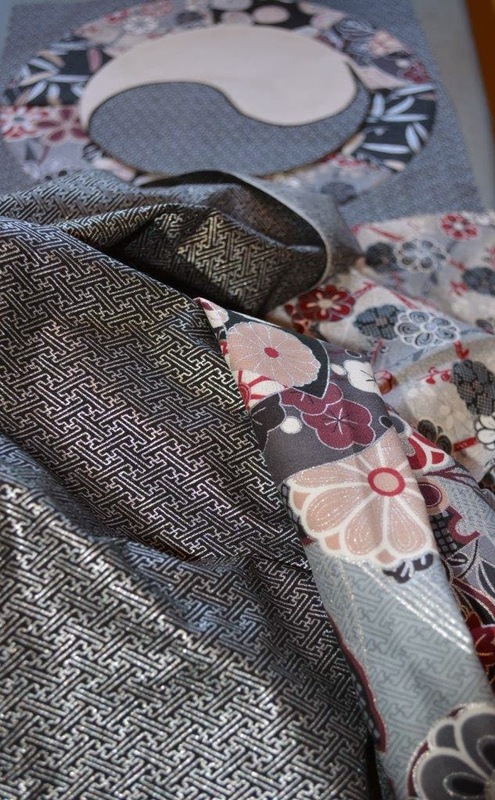 The "pepper" refers to a collection by Stof of Denmark, whose fabrics I like very much. My challenge to myself is to design a quilt which makes very efficient use of these cuts both in terms of time and waste; my frugal side insists on having very little fabric left over at the end. It's been a good bit of exercise for my brain before I indulge in these tasty treats. A little while back, I posted this pattern for a Winter Star Mug Mat on Craftsy. Nearly 8000 people downloaded the free pattern, making it one of their most popular. Thank you! This one was made by Joan Tufts and like everything Joan does, it's fabulous. 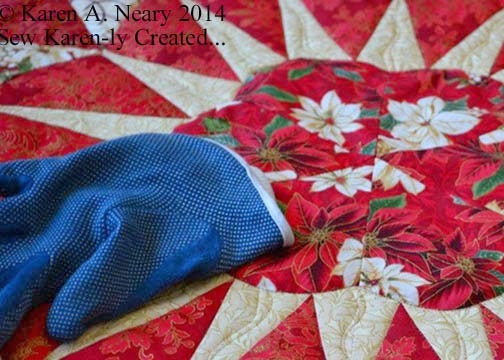 You can see more of her projects on her blog Ouvrages d"une Acadienne. There have also been a few pictures posted on the Craftsy site, including a pretty pink version. If you've made the mug mat, please send along a photo to post here. And if you haven't made one...what's stopping you? The pattern is free to download and it takes only scraps to make! The hard part: not the quilting, but deciding what to quilt... 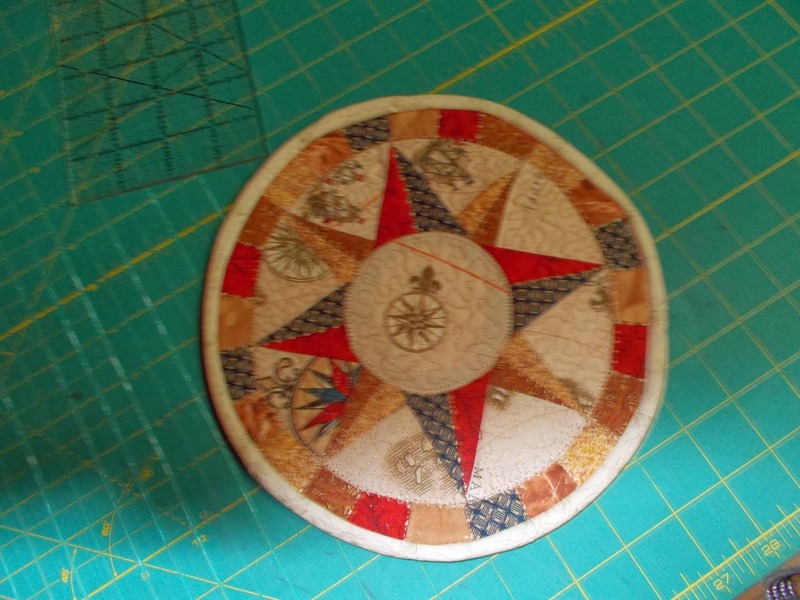 I hauled the pieced top around with me for two days hoping for inspiration to hit. It didn't. 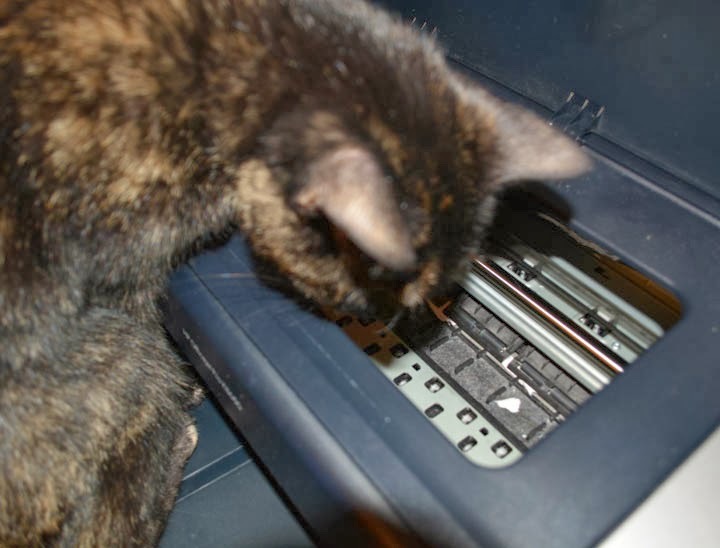 Sometimes the best option is to just put it under the machine and see where the needle takes you. It feels like we're in a bit of a time warp. 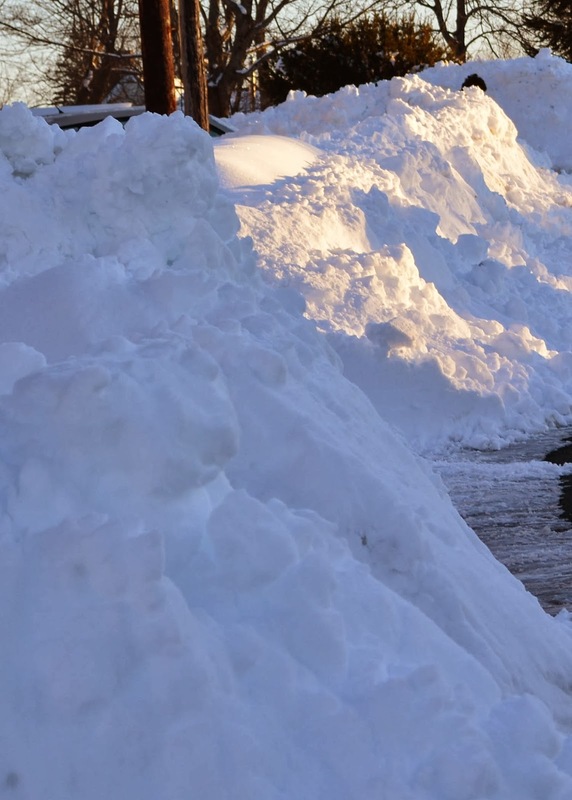 Outside it looks like Christmas...we've had so much snow this week it's unreal. Can you see my neighbour's black cap near the top of this photo? Here's a close-up, you can see his cap to the right and top of the picture below. 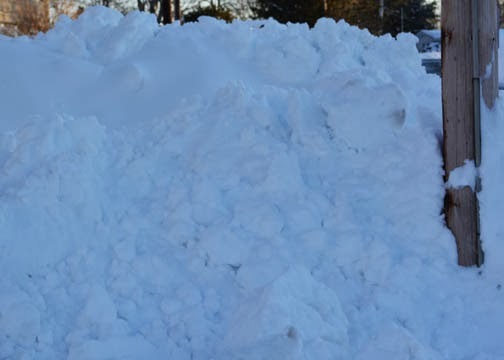 That's how high our snowbanks are! It isn't very safe for little kitties to be outside so ours are only allowed out with an adult present. 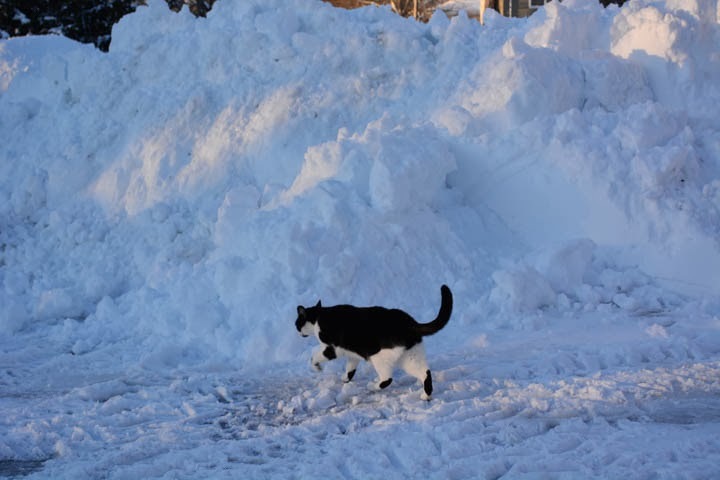 Maddie wasn't sure what to make of these snow mountains! 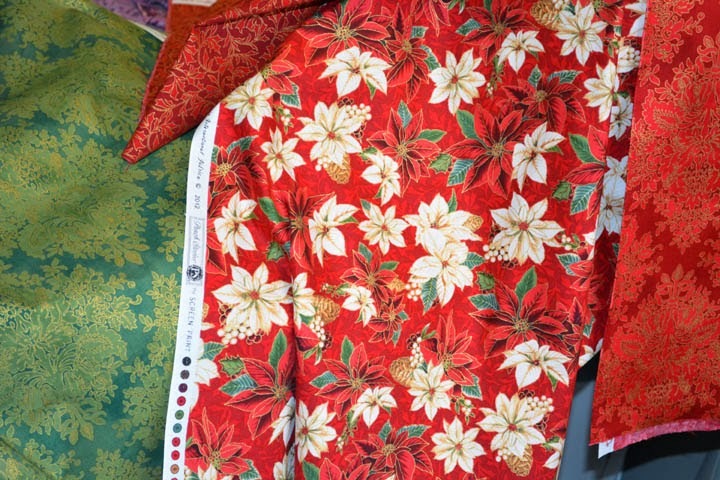 Inside, it's been feeling like Christmas as well with all these gorgeous seasonal Hoffman prints on my table. Yesterday I watched the women's hockey game between Canada and the U.S. and in the excitement sewed so fast I got my blocks all done. 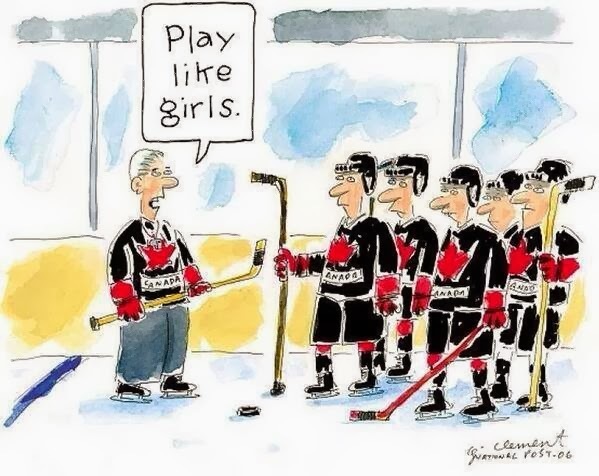 Yay Canada, a great game and a well deserved gold medal! 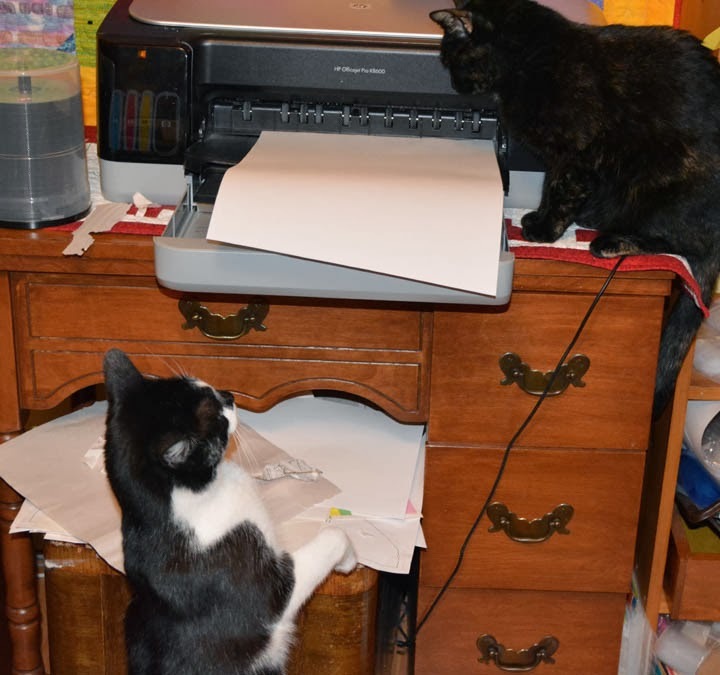 This morning I had a printer jam - and a jam in a wide format printer is a pain. 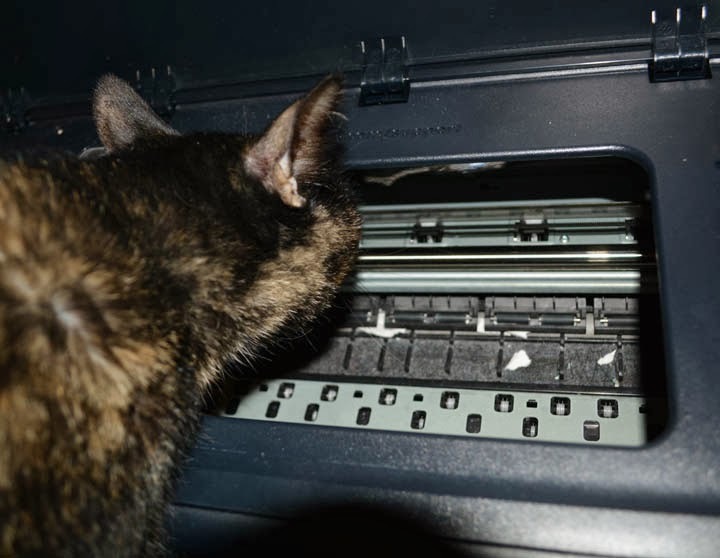 I needed to consult a technician for help. 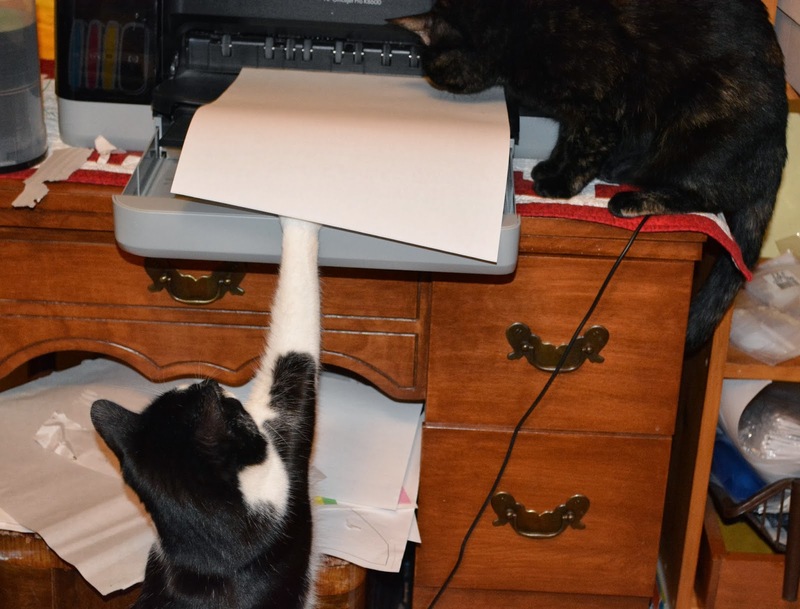 Luckily, I have in-house staff who handle such emergencies. 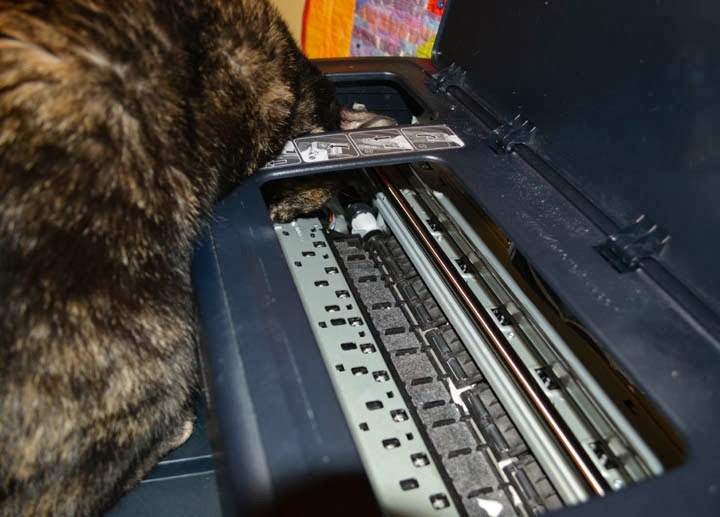 It didn't take long to find the source of the problem. 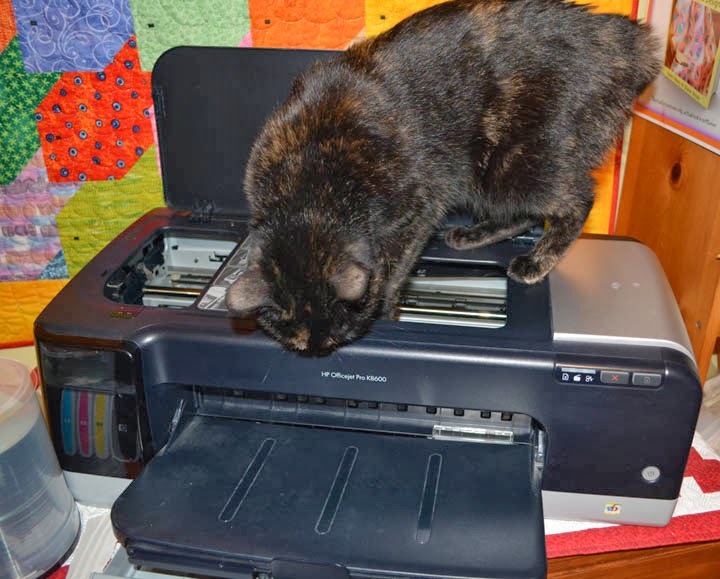 After a thorough investigation (including climbing inside to check out the print heads) the technician decided to call for back-up. A second opinion was offered quickly. Success! The jam is cleared and the paper is feeding freely again. What would I do without such helpful staff? The pattern for Harmony is now ready and available as an instant download on Craftsy. You can find it here. 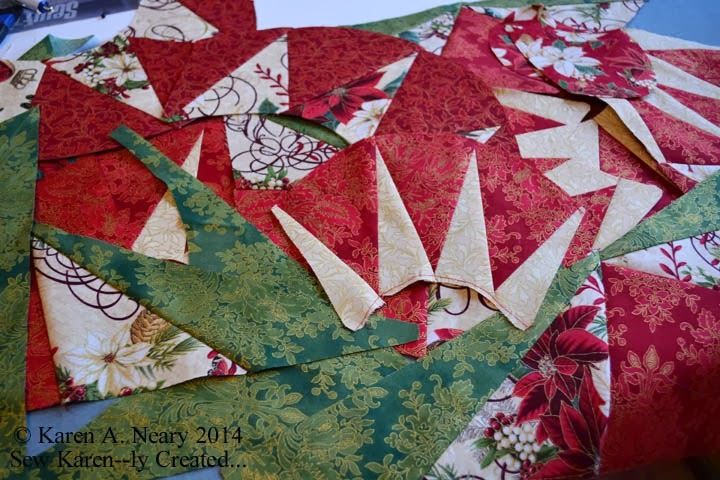 It is a simple project, requiring only basic patchwork and appliqué skills. (Naturally, mine is machine appliquéd.) It finishes to 20" x 24", plus the block and charm which hang off-centre from the bottom. Each colour of blocks was quilted in a different motif. Thanks to my good friend Cheryl Coville for her help in checking the instructions. This is "Harmony", pieced from the Asuka collection by Hoffman of California Fabrics. Pattern to follow shortly. My new quilt, which uses a collection from Hoffman called "Asuka", is coming together quickly. That black fabric in the front of the photo is dazzling. Shot with silver threads, it catches the light and tosses it back in all directions. It's hard to believe that mere cotton can be so brilliant and so beautiful. Do you recognise this as one of my patterns?! Me neither! I was just blown away to see what clever and creative Cheryl made. Check it out here! 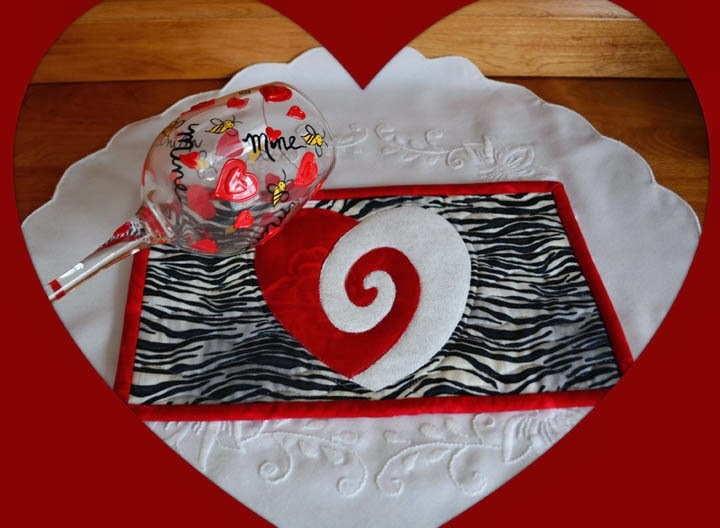 Here's a quick project to stitch for your special someone for Valentine's Day. This mug mat is larger than most, as it's meant to be shared by two. Fusible appliqué means you can whip this up in time for the big day. Finished Size: 6-1/2" x 11"
* Quilter's Rose by Stof used in sample project. 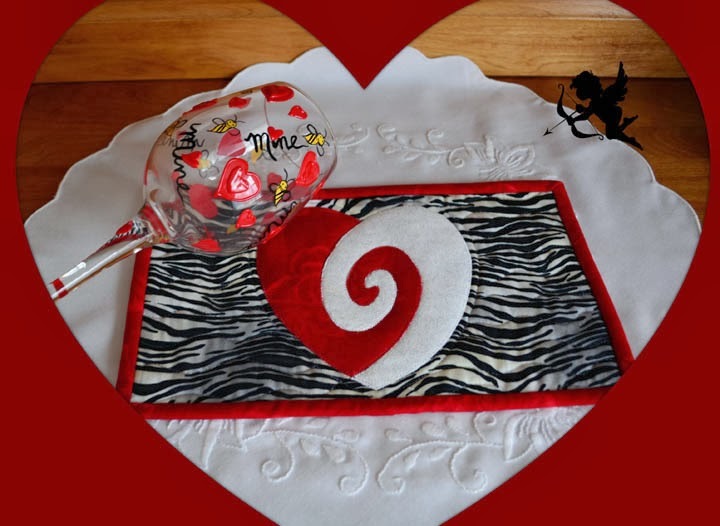 You can get the pdf template for the heart for free here through Craftsy. There is no charge to join Craftsy, and it's an easy way to keep your pattern library organized online. Make sure when you print the heart you choose "actual size" from the list of print options (no scaling). Please note that the design is already reversed for you, ready for tracing onto the back of the fusible web. Trace heart design onto fusible web. Note that the heart has two sections. Fuse one section to back of red and one to back of white fabrics. Cut out carefully. Remove paper backing and arrange the two heart sections so that they are snugged up with no gaps in between. I use a corsage pin to gently nudge the pieces into place. Fuse to centre of background fabric. With stabilizer underneath work stitch around edges of heart to secure. Sample shown uses straight stitching, but a narrow zigzag would add nice definition to the edges. Trim stabilizer. Add batting and backing, pin baste. Quilt. 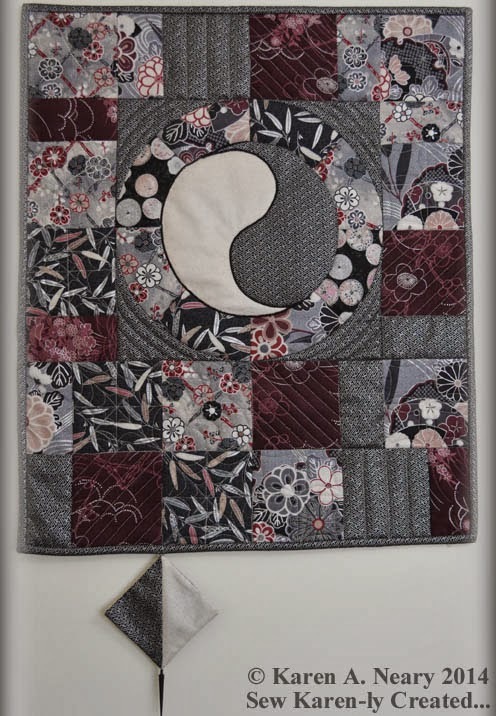 Sample shown is quilted around the outside of heart and echoed 1/4" away. 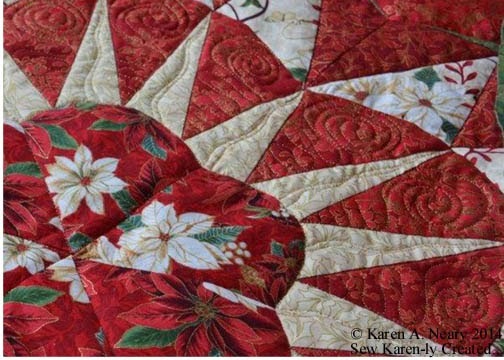 Squiggly lines are free motion quilted from the heart to the sides. Trim mat. Mine is 6-1/2" x 11. Fold 2-1/4" binding strip in half lengthwise, wrong sides together and press. Sew to front of quilt, mitering corners. Flip to back and hand stitch in place. This enitre pattern is available in a printer-friendly format as a free download through Craftsy.